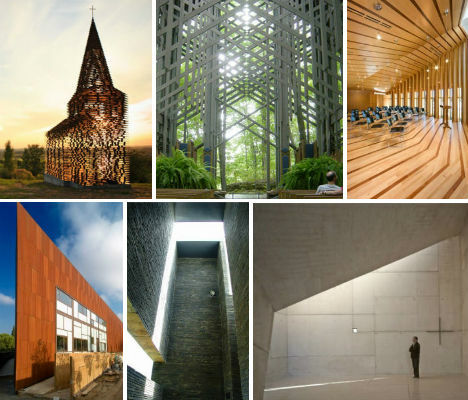 Sacred spaces are slowly moving out of the intricate baroque and Gothic details of traditional church architecture and into cleaner, brighter, more minimalist designs. While a classic cathedral with all of its spires and stained glass will never cease to inspire wonder and awe, there’s something to be said of spare, modern church designs that instigate internal reflection and sharpen the focus of worshipers on the beauty of the building’s natural surroundings. These 13 contemporary structures embrace the future rather than clinging to the past. This stunning church, designed by Belgian architects Pieterjan Gijs and Arnout Van Vaerenbergh, lets in the sunlight with a transparent design. 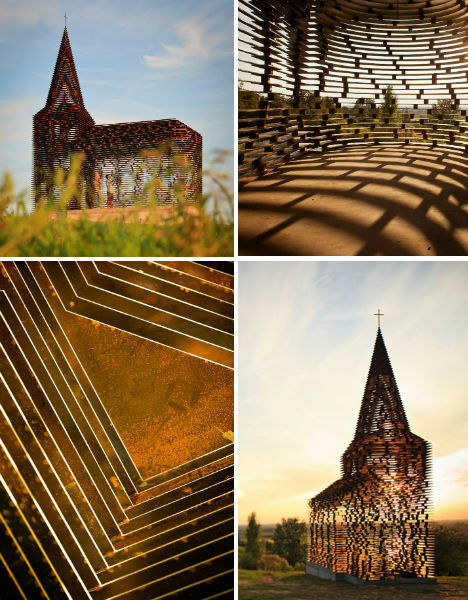 Located in the Belgian region of Haspengouw, the church is part of a long-term art installation called Z-OUT which aims to place unexpected structures in public places in the Netherlands over the next five years. It’s made up of 100 stacked layers and 2000 columns of steel plates, and the church can look totally solid or seem to disappear entirely depending on your viewpoint. 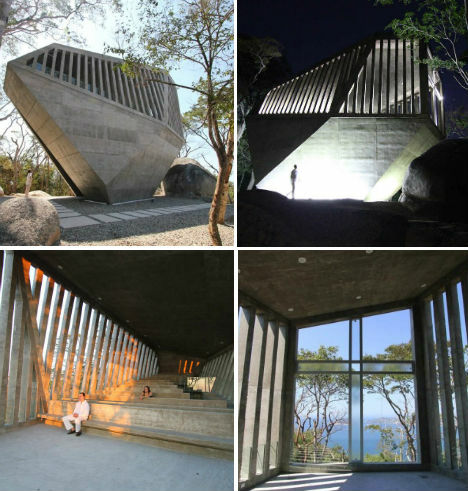 Looking more like a giant public sculpture than a structure you can actually walk into, the Sunset Chapel by BNKR Arquitectura is a concrete memorial chapel for mourning loved ones, located in Acapulco, Mexico. The chapel is simultaneously solid and open, with slats and glass walls that give visitors beautiful views of the sea. Visitors ascend a staircase to get to the elevated chapel, which was raised above the tree line and nearby boulders. 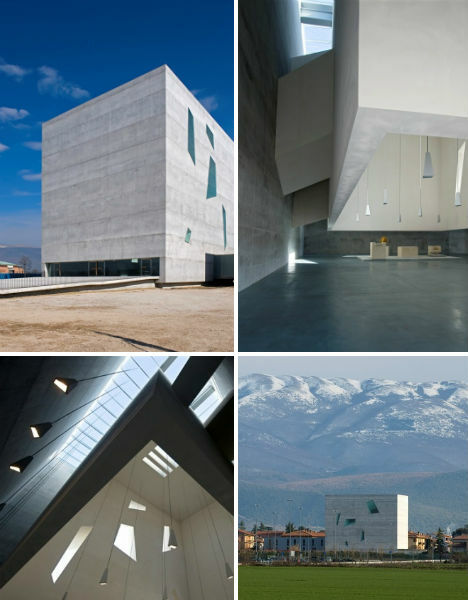 Italian architecture firm Fuksas added this concrete volume to the San Paolo Parish Complex in Foligno, Italy. 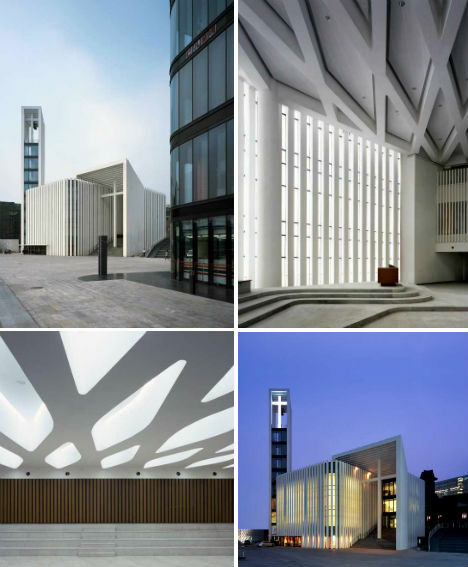 This design, which won a national competition for the construction of new churches, was chosen both for its solidity, which becomes “a symbol of rebirth for the city after the earthquake,” and for the way that it equates natural daylight with the ascent to heaven. This little wedding chapel is as picturesque as they come, set on a koi pond on the Risonare hotel resort in Kobuchizawa, Japan. The chapel consists of two ‘leaves’, one made of glass and the other steel. 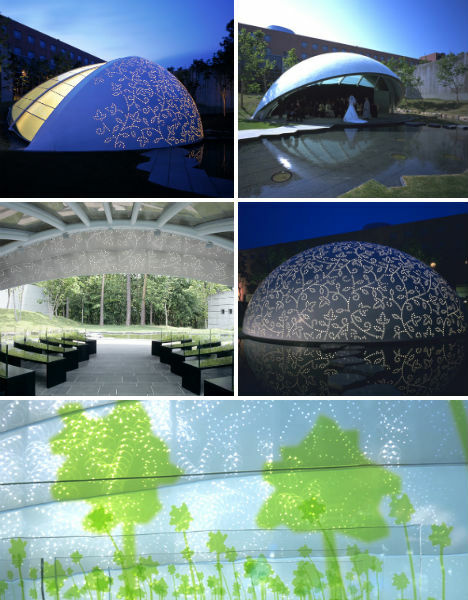 The steel leaf is perforated with acrylic lenses in a floral vine pattern which is illuminated from the outside during the day, and from the inside at night. This leaf opens at a strategic point in each wedding – when the groom kisses the bride – in order to reveal the natural setting beyond. Bright, open and angular, this modern Christian church in Beijing not only lets in lots of light, but replaces the traditional ‘church yard’ with a roof terrace that functions as a usable outdoor space for parishioners. The building blends in well with its urban surroundings but maintains its sense of sacredness, its vertical tower visible for miles. 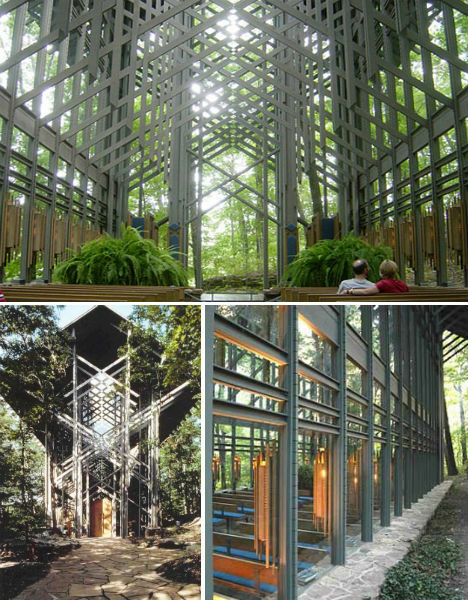 Even atheists couldn’t resist spending an hour or two enjoying the awe-inspiring views of Thorncrown Chapel in the woods near Eureka Springs, Arkansas. There’s a lot to reflect on – like the way the angled trusses of the structure mimic the rise of the trees outside, and the way the sunlight sparkles on the glass. The church was built in 1980 by Frank Lloyd Wright alumni E. Fay Jones. Replacing a neo-Gothic chapel that was unable to stand up in poor soil conditions, the new ‘St. 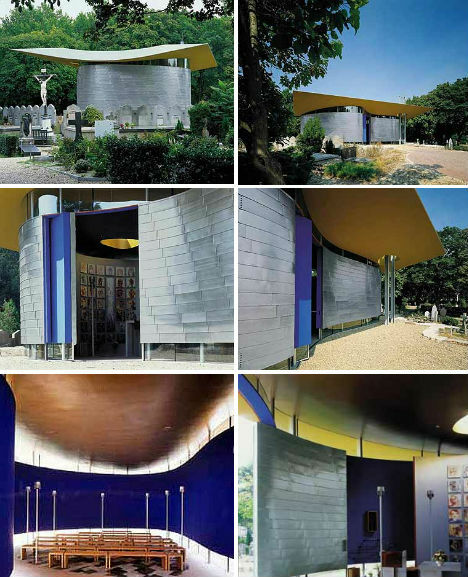 Mary of the Angels’ Chapel in Rotterdam’s Catholic St. Lawrence cemetery is clearly contemporary, yet understated. Blending nicely with the aged headstones that stand adjacent to it, the structure features a wave-like outer wall, a sunny roof and a contemplative chapel painted in royal blue with a golden ceiling. An opening in the roof above the chapel space lets in natural daylight. Have you ever seen a church that looks anything like this? 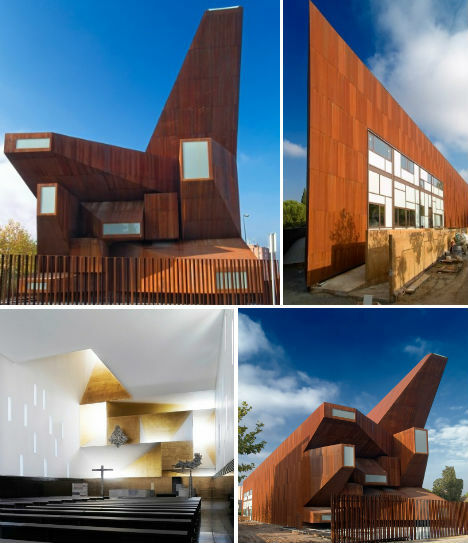 Architects Vicens & Ramos certainly came up with a one-of-a-kind design for the Parish Church of Santa Monica in Madrid, Spain. The project integrates into one building all of the needs of the parish including offices and priest housing. The architect describes it as “an explosion, frozen in an instant after detonation”, which is an interesting image to inspire a place of worship. 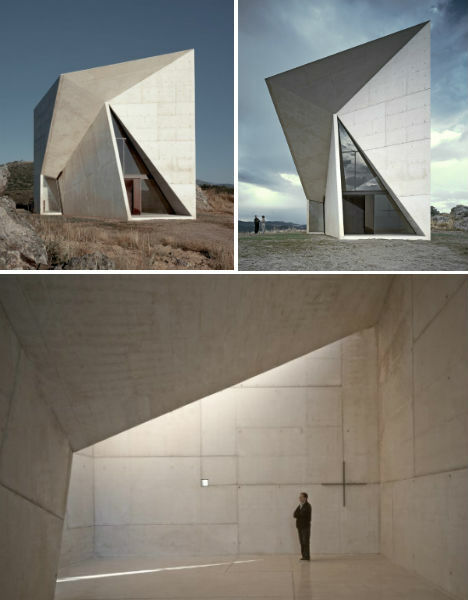 Here’s another chapel that resembles a giant piece of public art rather than a church. 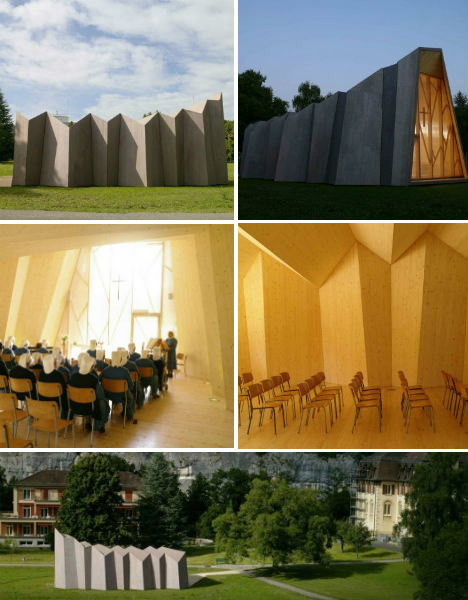 It’s the temporary Chapel for the Deaconess by Localarchitecture and Danilo Mondada for Hôpital de St-Loup, Switzerland, designed to accommodate religious worship while the main building, a historic building, underwent renovation in 2007. 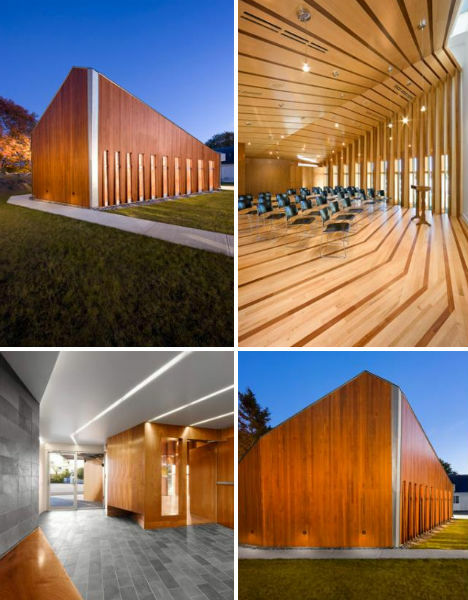 Though meant to be transient, the building is nevertheless anything but disposable, consisting of a folded origami-like volume made of wood and transparent plastic panels covered with fabric. Not only is this church beautiful in its simplicity, it is also deeply meaningful – more so, perhaps, than most new construction. 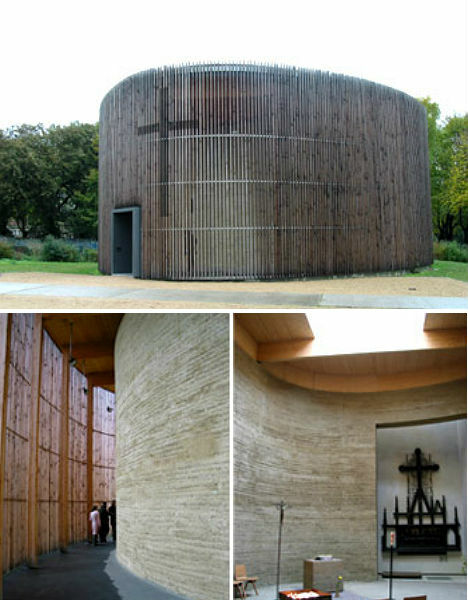 That’s firstly due to the fact that the Chapel of Reconciliation is both Germany’s first public rammed earth building in over 150 years and its first rammed earth church. 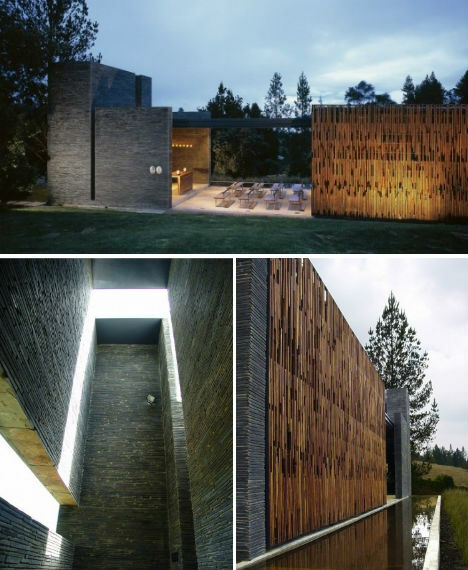 But even more than that, the building is infused with a sense of history thanks to a thoughtful addition by architects Rudolf Reiterman and Peter Sassenrath: the rammed earth walls were made using clay mixed with the ground-up remains of the former church, which was built in 1894.